Hey, everyone! We have even more bargains for you to have a look at with our Deals Week offers! 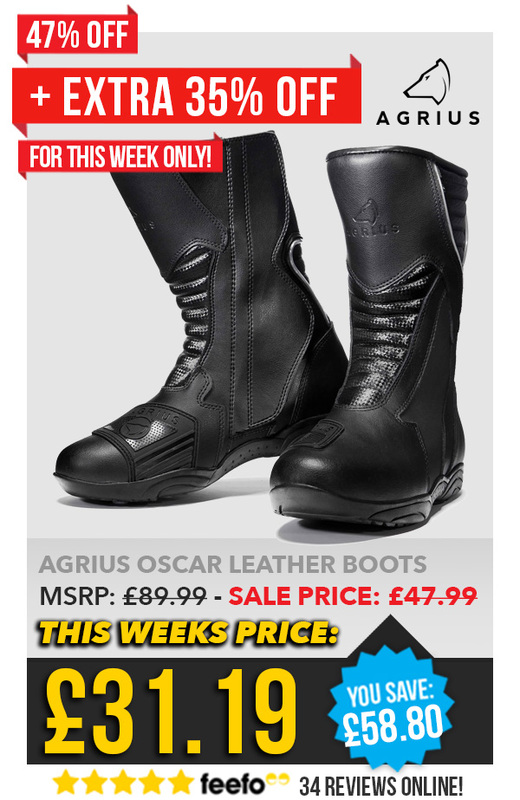 The Agrius Oscar Leather Motorcycle Boots are also on the list, a sturdy, comfortable pair of bike boots going for a nice, low price until the 27th! I’ve worn Agrius boots myself in the past and I do have to admit- they’re really comfortable. My Agrius boots are still my most comfortable pair, I only wish I hadn’t worn them literally all day every day, lived my life in them so that they still looked tidy and new. But it’s a testament to how well made they are and how they’re designed to keep the rider feeling good. Sturdy leather with plenty of protection, waterproof for the rainy days and a triple density in-sole for comfort and hygiene. The Agrius Oscar Leather Boots are brilliant and at £31.19 they’re a great bargain and an amazing addition to our Deals Week list.